The artwork of Henry Michael Zunino draws its influence from his rich Italian cultural heritage combined with the modernism of his American homeland. Born in Boston, MA, of an American mother and an Italian father, he spent his early childhood in Italy, where, at the age of six, his precocious talent for sculpting was discovered and nurtured. Educated in classical Italian manner, his greatest cultural and aesthetic inspirations came from the great Italian masters such as Canova, Bernini, Michelangelo and Leonardo. Unique to Zunino's art is a deep love for nature, which he decided to study in depth upon his re-entry into the United States. Upon achieving a Baccalaureate from Boston's Suffolk University, he went on to study the artistic modernism of such American masters as Martin Puryear and Tuck Langland, and the techniques used in American "folk technology". Zunino's art is not created as a social or political commentary or to confront convention. Like many modern day sculptors, Beauty for the sake of Beauty is the only pretension of his art. 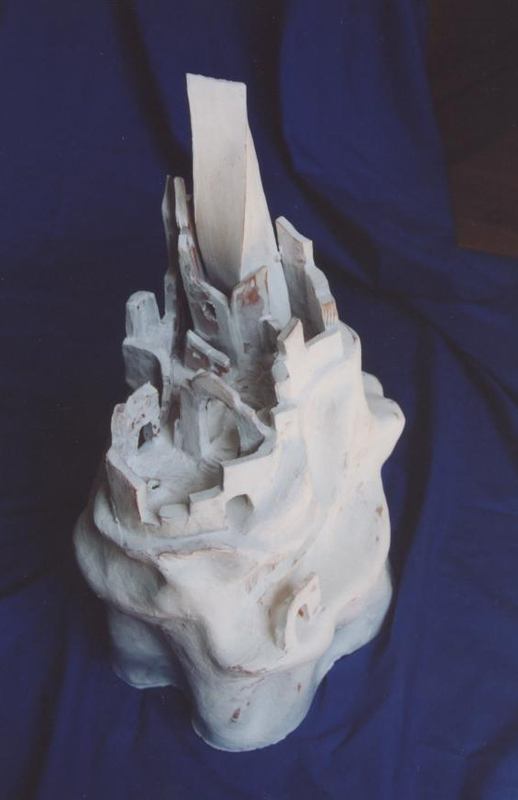 Of course, as any Italian sculptor, he has always valued craft, meticulously hand-carving all of his pieces in natural materials such as wood, clay and stone. Zunino has received many art awards in New England, and a vast majority of his pieces are now part of private collections in both Italy and the United States. His talent and charisma have earned him the prestigious "Who's Who in American Colleges and Universities" award reserved for promising young American intellectuals. In Italy, his work has captured the attention of the influential Pythagoras Cultural Association, that awarded him the title of "Sculptor Optimus" in 1996. 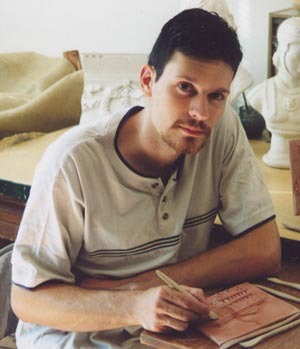 Working mostly on commissions, he has the unique opportunity to express his artistic talent without the constraints often imposed by commercialism and the demands of mass production. In the Boston area, you can admire a life-size Byzantine Madonna and Child sculpted by Zunino and permanently housed in Saint Anthony's parish in Everett, MA. His talent as a restorer can be seen on the cherished statue of Saint Anthony found in the Boston's historical North End. Most recently, his bronze plaque commemorating the achievements of Guglielmo Marconi has been unveiled at the Logan International Airport's Terminal E.
3At left, a photograph of the artist's native Matera, Italy. 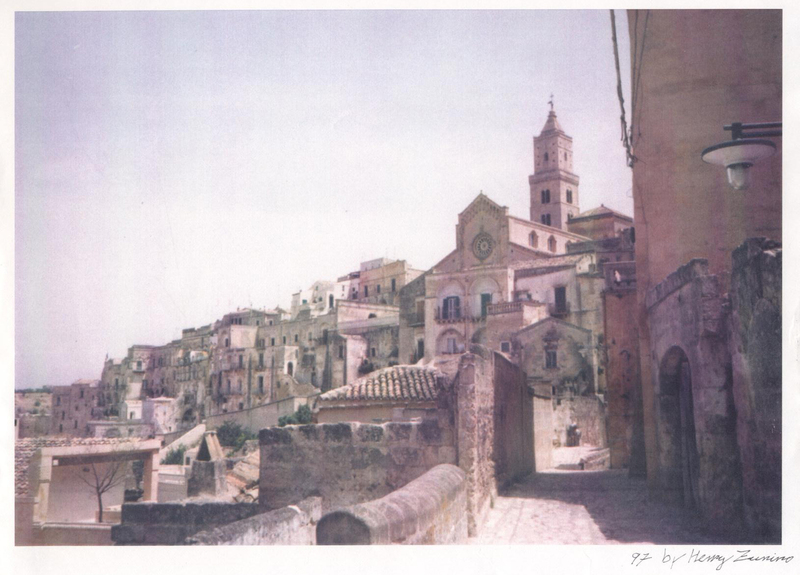 4At right, the artist's abstract rendition of the historical Sassi de Matera.